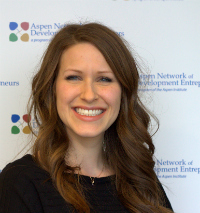 Abby joined ANDE in January 2016 and supports the research initiative, with a special focus on the role of accelerators in emerging markets. She served two years with ForgottenSong, a non-profit organization that supports small business as a means of community development in war-torn countries. More recently, she co-founded Hello Cocoa, a bean-to-bar chocolate company based in Arkansas. Abby is passionate about improving the efficiency and effectiveness of international development efforts and has led projects in Belize, Iraq, and Mozambique. She holds a Bachelor’s in International Business and Economics and a Master’s in Economics from the University of Arkansas.